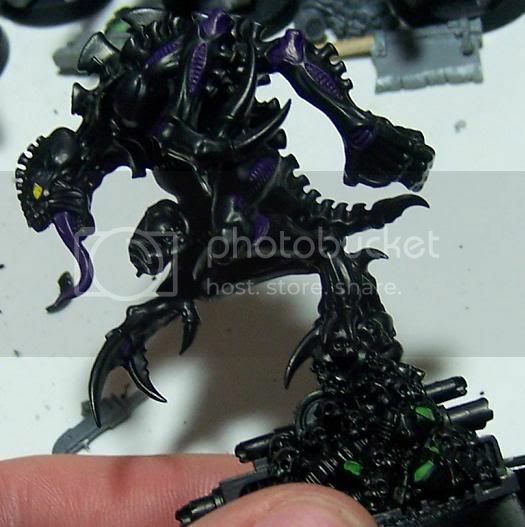 Starting to get really excited about the Tyranids again, the codex is just 2-ish weeks out. It is a bit of a mixed feeling though. On the one hand I am really looking forward to the new codex, kits and possibilities. Heck I've even opted to paint the Space Hulk Brood Lord for a friendly little painting duel over at Astronomican forums. On the other hand, there is the matter of some unfinished business. I've had this FW Trygon collecting dust on a shelf for a very, very long time now (heck, could be over 2 years by now). My buddy Ron Jones, former admin over at Astronomican, helped me out with this beauty and some other FW bits. The other stuff got painted long ago, but this critter was kept being ignored. SocI'm finally going to tackle this monster! Hopefully finishing it prior to the official GW release of the plastic kit......all in the hopes of avoiding utter embarassment and perhaps to put a smile on Ron's face when I can send him some pics of the finalized product. More on this fabulous mini over the course of the next 2 weeks, the deadline is set of the 15th!